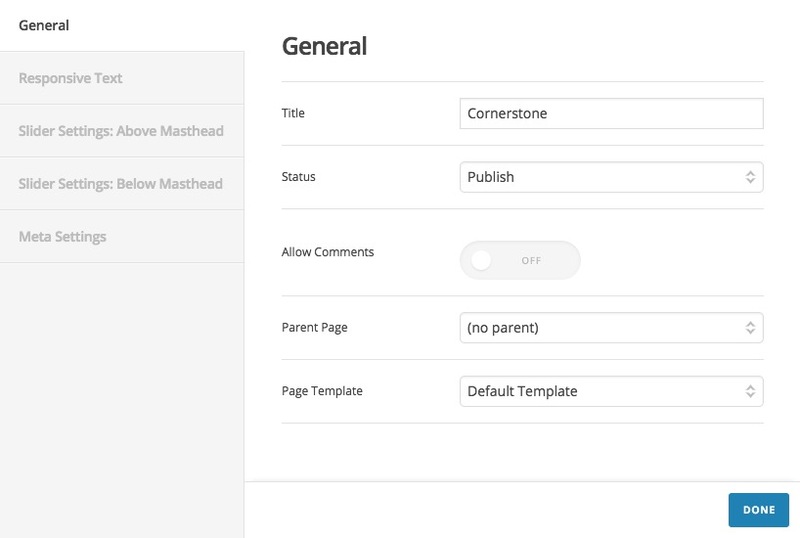 General - The general tab contains the options which you also can access from the standard page edit screen of the WordPress. The options also are available here for the convenience. The options are Title, Status, Allow Comments, Parent Page, and Page Template selection. 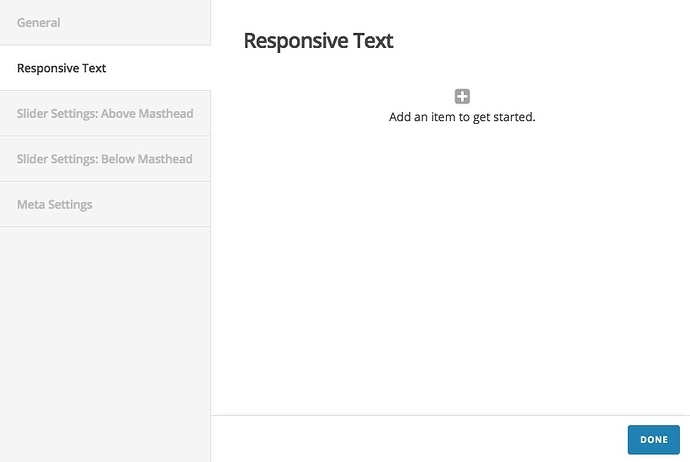 The responsive text has Selector, Compress, Minimum/Maximum Size options. The selector option is to add a CSS selector which will be used in the Class option of any element to make the text of that element responsive. The compress is the compressing rate of the font size when the browser window shrinks or expands; and finally, the Minimum/Maximum size is the limitation which the size change will not go lower/higher than the designated sizes. You can add as many Responsive Text blocks with different selectors as you want and use it in the different sections of the Cornerstone. Slider Settings: Above Masthead - This is the exact same settings that you can find in the Page Options section of the standard WordPress page editing screen. You can select the Revolution Slider name which you have created before to show it above the masthead section of the theme. You also have additional options to fine tune the slider behavior such as the background video or the scroll to bottom icon details. Slider Settings: Below Masthead - This is the exact same settings that you can find in the Page Options section of the standard WordPress page editing screen. You can select the Revolution Slider name which you have created before to show it below the masthead section of the theme. Meta Settings - This is also a mirror of the most used options that you can find in the Page Options of the standard page edit screen of the WordPress. You can add custom body tag classes, add alternative text for the title of the page and so on.